Today's post is a bit provocative and somewhat controversial. But for the sake of kids across the world, I also believe it's necessary that we address the issue. I know that in sharing this post, at a minimum, we can initiate dialogue that can result in a positive outcome for families, especially our children. Last week I was at a networking event. I was there representing my accounting firm (I'm a Certified Public Accountant - CPA). I was sitting at a table speaking with a group of people. And somehow we began discussing our families and our interests outside of our daily professions. After listening to others share their stories I took the opportunity to mention The Upbeat Dad and my vision for the organization. I was just meeting these people for the first time so I really had no idea about their lives and life experiences. There was one lady who stood out above the others. She was more attentive and engaged than the rest. She even mentioned to me afterwards that she was tired from a long workday and was about to leave. But when I began speaking, as she listened, she was captivated by what I was saying. The thought that a man started an organization to encourage fathers to be involved in their kids' lives was just fascinating to her. She shared with me that she was married for 17 years but divorced about 5 years ago. Her marriage produced 2 children - a boy and a girl, both of whom are now teenagers. During the marriage, the kids and her former husband were close. He was involved in their daily activities - school, sports and other social activities. As is often the case when marriages fall apart, the divorce was not a pleasant experience for that family. After the divorce became final, her former husband relocated and thus began a new chapter in their lives. According to her, her former husband became so cold and indifferent towards her and the kids that it's almost painful for her to talk about. He rarely ever contacts the kids for any reason. He's not involved at all in their lives other than the occasional phone call every month or so. He's become indifferent to them in just about every area. When it comes to child support, that's lacking as well. According to her, even though she has the legal right to pursue him for the funds needed to help support the kids, she won't do so because it shouldn't have to take a court to force him to take care of his children. One of the most disturbing things she mentioned was that her son had a medical emergency and had to be hospitalized. She called her former husband to notify him. She left him a few voice mails with no response. It wasn't until a month later that he called to see how his son was. In essence, this father has become a deadbeat dad. For some reason, based on his actions, when the marriage dissolved, in his mind, his role as a father also dissolved. No marriage, no wife, no children. Before I go further let me say that I only heard her side of the story. Perhaps he would paint a different picture. I do know, however, that this story is not unique. It's not an isolated incident. 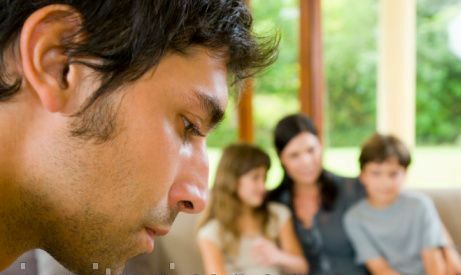 Many fathers "divorce" their children simply because marriages and other relationships are over. On this blog, I have shared different aspects of my personal experience. I strongly believe that the family court system is anti-family and is quite often anti-male. I even wrote a post with the title The Great Oxymoron: Family Law. So I can say, based on my experience, I do understand why some men become bitter and walk away. They feel they have no rights in a system that functions against them. So they simply try to walk away, neglecting their responsibilities and obligations to their children. I don't share their sentiments but I do understand why they've become bitter, cold and indifferent. The unfortunate reality is that they handle their frustration with the system by essentially punishing the most innocent parties - the kids. Fathers, I urge you, no matter what should occur in your relationships, to stand up for your children. You could feel cheated by the legal system. You could feel that you got a raw deal. But that has nothing to do with your obligation to your kids. They need your love and support and particularly when relationships fall apart, they need to be assured of your never ending love and devotion. Child support is a part of the equation but there's so much more than that. The lady who I referred to earlier in this post said to me, "I don't even want him to send any money. I just want him to call the kids every now and then to say hello." That's a bad testimony about a father who, at some point, was close to his kids. this truth you cannot doubt. once in you're never out. Remember this: once a dad, always a dad. Let's keep this in mind and do what's right for our kids. Regardless of your relationship with an EX, children are the innocent victims. They need a mother and a father equally. There is no excuse to emotionally or financially abandon your child. The pain a child feels from the rejection of a family member is often carried with them for the rest of their lives. I appreciate this blog and have devoted my biz to resolving issues like this. Please reconsider if you are a parent who is using your children to make a point to your ex. Children are not human shields and often just want your love and support. They dont want to be put in the middle of your personal issues. They just want to feel part of a family and accepted in your heart. Very well stated. Thanks for sharing. I've seen this play out all too often. And when the dust settles, kids are the innocent victims - collateral damage, if you will. It's a sad reality. Hopefully with sites such as yours, we can sound the alarm and both dads and moms will rise above conflict and think of the kids first. Great post. Sad story. Please stop hurting our children. Stop being a deadbeat dad and start being an upbeat dad! Wow. What a story. It makes me so sad to think that he could just walk away from his children like that. I can't even imagine how those kids feel. Also, it was a different perspective to be heard. You often hear about dad's leaving early in a child's life but not so much when they're teenagers/adolescents. Guys, today I am just playing devils advocate! (I like the posts upbeat dad!) But suppose the Dad was tired of too many expectations on him. Pay the bills, provide, do this do that. What if this family that he has left are a bunch of A-holes? I know some kids that have been raised by a spoiled mother and have become as spoiled as the parent in their attitude. Without knowing the circumstances we should not judge. It is very easy to be pro family and anti male in North America and we need to empower more fathers and not give so much right of way to mothers who believe that as the "person that carried the kids" they have the right to put unfair expectations on the father and drive him away. Hope I wasn't being to brash. Sounds like a cop out to me. The father is the provider. Yes, some moms take advantage but it does not give the right for father to disappear. Not accepting this scenario. My parents recently went through a divorce - and my mom has divorced us. She was so bitter from my dad leaving that she decided to "focus on herself". She kicked my 18 year old, mentally ill sister out to live on the streets, sold her house and no longer contacts any of us. We've tried contacting her to no avail. She's quick to tell everyone else how important we are to her, yet she never talks to us. My dad - although the one who left - has never put us on the back burner, even though he's starting a new life. He's very much in contact with us. I'm thankful to have such an amazing father. It is true, in most cases the father does walk out on everyone. But I guess its different here. Here my dad left my mom, and my mom decided that was justification to leave US and abandon her motherly duties. I regret what happened to you. It is heart-breaking. I don't think you'll be able to understand why your mom did that. It is a lesson I learned through life too. Trying to understand why will take up your life. Best to just move on and plan what you are going to do with your life. You have one and you can make it good with the people you've chosen to be in your close circle. Some people can just move on and rebuild their life without looking back. Me--I couldn't do that to my children. It isn't as uncommon as you'd think. I worked for a family law attorney and it was kind of healing for me to see what people do and that I am not the only one whose parents divorced. Mine divorced when I was age 8. We had to leave a foreign country by ship to return to the USA. I can recall vividly laying on the top bunk in the ship's cabin thinking, "I am the most unlovable child because I cannot even keep my parents together." Children have no reasoning skills at all and I saw that too with my own children when I witnessed their loss. I divorced when my first born was age 2, and I was pregnant with my second. He betrayed me. I wasn't going to live 13 years with a philanderer like my mom did. So I moved on. He married his concubine and she encouraged him to abandon his children. Children do not understand this at all. They blame themselves. They lose their worth all because a father or the absent parent will not contact them. At Christmas time my children had many gifts from our big, big family. But they both said to me, 'I know who doesn't love me.' It was their father. They were depressed on Christmas because nothing from dad. I was incensed with their dad and I wrote one last letter to him explaining if he doesn't contact them then I will no longer be writing and sending pics etc. I kept sending him photos of them as if he cared. I don't know. I had a garnishment on his wages and the money stopped when he was let go. He relocated and there was no child support. When he was served, he petitioned the court for visitation--the exact visitation that he had and never exercised! So I knew his game and I asked my attorney to just ask him to sign off his rights. I no longer wanted to have to do this and I knew I would take care of my children. He sent a letter indicating how hard it was for him to do this. I wish the court would let my children read that letter but it is confidential. So with that, he was gone and had no more responsibility. I never spoke an ill word about their father. They are part of him and putting down the spouse only hurts the children. I know because my mom did it all the time. I look like my dad and so putting him down puts me down. I told my children to look for him when they are 18 yrs old and visit him. Each of them did. My daughter lived with him until his wife got angry with her and put her on the street. (I really dislike that adulterous whore). Then my son went to see him and he lasted 30 days and left on his own accord. They don't like him and his wife is very controlling. She will not allow the stepchildren to have direct contact with him. And he lets her have the control. There are seven children altogether since he married three times. In my mind I refer to him as The Pollinator. They use to do drugs and drink but now they are Mormons. She wants to act like she is the Matriarch of these seven people. Mine aren't buying it. She is a cold, cruel woman. So adults behaving in their own interest can be very hurtful to developing children. Children's brains are developing as soon as they are born and this kind of stress hampers optimal growth. I wish you well and I regret you are part of this horrible experience. Hugs. Jessi, this is very sad. From my vantage point it seems like your mom needed help and did not get it or seek it. Seems like depression set in, and that was her dysfunctional way of coping with her life. It is really bad what she did, and inconsiderate and uncaring how you and your siblings were treated, but maybe you are better off not being around her. Chances are she was so messed up emotionally and not seeking help, that she would have ended up totally ruining your life and the rest of the family. This thought may not help at all, but you may have been lucky to have escaped serious mental, verbal and emotional abuse from her as she does not seem to know how to cope effectively. Hope your life without her improves daily. What an excellent reply and I agree with you. Thanks for posting. It's like you wrote my story... There is no excuse. I ask nothing for myself, rarely anything for our son, I receive no child support, he is 10k in arrears..I don't call him, but our son does...he rarely answers or responds. It makes me ill to see the damage it causes our son, damage that will stick and effect him throughout his life. To me...this is not a Man. I understand what you are experiencing. You can take action to collect the late child support. You can file a claim with the District Attorney's child support division. They will do the leg work to secure the funds that your child needs. Also, they will garnish any IRS refunds. Do it for your child. Yes, it is very heartbreaking to see how child suffer from neglect of a parent. My church brought a man to me that wanted to be my son's Big Brother. The man was a good one who had a wife and two grown children. His background is spotless and my son benefitted from his attention. It isn't the same as a father but it was a decent male who showed concern and who my son could have fun with. My daughter too longed for male attention (father). It is very hard to deal with these situations. My son grew angry and I had wee problems with him as a teen. Nothing horrendous but it wasn't what I wanted for him. He did find his way and he is a dad now. He adopted his wife's daughter and they have a son. My girl is a mother of three and married to a gem of a guy. A man who always wanted to be a father and has taken a leave of absence to be home with each baby! There are good men out there. We just have to be more discerning. I did garnish my children's father's wages and I did eventually ask him to sign off his rights. It came to that. My kids grew up and did visit their dad. They are in contact with all their siblings and that was my hope all along. They have a wonderful relationship with all their brothers & sisters. I encouraged my children to seek him out and they did. They know who he is and aren't fooled by him or his wife. They see him for who he is. My daughter though is distant with him as she will not allow him to hurt her again. What about deadbeat Mothers? There are those who throw their kids on THEIR parents or with the fathers and with NO support or visitation. There are those who leave their babies somewhere for someone else to find. There are those mothers who KILL their children... 1, 2, 3 and 4 children. All killed. Yes, sadly there are deadbeat mothers. There are mothers who put their interests first by exposing their child(ren) to the wrong kind of people: Violent. The children witness horrific incidences all because the mother is too weak to see the error of her ways. I've seen this many times in the family law proceedings I helped with at a law office. I was support staff. The mother is more needy than her children and their safety is risked because she thinks she needs this violent man, drugs, drinking in her life. Not good for anyone. Very damaging. Unless she gets well, what do you do? You keep the children safe by putting them into the care of those who are decent. This is why many grandparents have custody of their grandchildren.